Some things just don't go away, no matter how often they're studied, debated, litigated and tabulated. Take unintended acceleration -- cases in which a car unexpectedly lunges forward. Scientists at institutions up to and including NASA have concluded there's nothing to it but consumers continue to say otherwise. "NHTSA (the National Highway Traffic Safety Administrtion) has not identified any defects with the vehicles that can explain simultaneous failures of the throttle and brake systems," said NHTSA's Catherine Howden in a recent press release urging drivers to be sure they weren't accidentally pressing the wrong pedal. 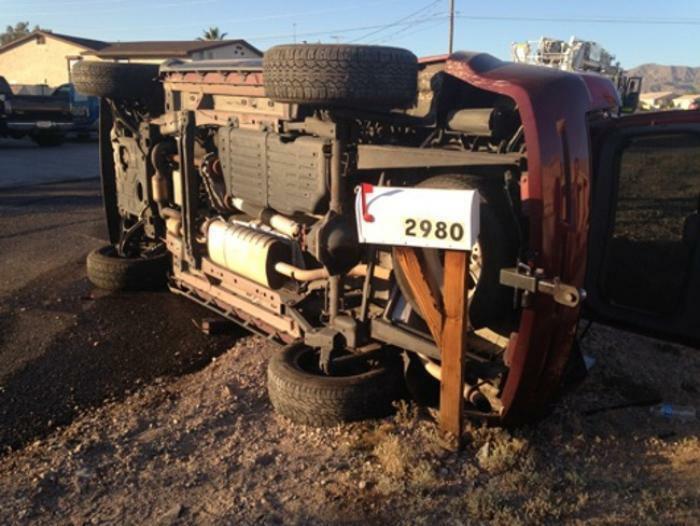 This doesn't sit well with Peggy of Lake Havasu City, Ariz.
"On March 28, 2015, my Grand Cherokee Jeep 2007 in pristine condition just hit 70,000 miles and within less than one hour later my Jeep was totalled -- upside down outside my son's home and me unconscious on way to hospital," Peggy said. "I guess I put quite the show on going down small embankment after veering away from homes and two vehicles in driveway. Jeep crashed up on its side, now totalled. The neighbor whose home I missed came to visit me and told me how he could not believe I was able to veer away in such little time." NHTSA estimates there are 16,000 "preventable crashes caused by pedal error." It urges drivers to keep their feet in the middle of the accelerator and brake pedals and to wear suitable shoes. "Footwear such as flip-flops, heavy boots, or high heels can contribute to pedal error crashes. Wear flat soled and light-weight shoes whenever you’re in the driver’s seat," advises Ms. Howden. She might also have mentioned floor mats. Toyota, you may remember, recalled about 10 million cars after a series of accidents apparently caused by ill-fitting floor mats which caused the accelerator to jam. 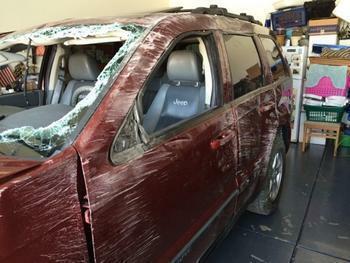 Peggy said she had just completed a long drive and the Jeep had been parked for just a few minutes before the accident. "I had been in California picking up glass items in cabin and things for my son. Drove to Arizona, my son took small trailer off backing into his driveway and turned engine off. I stayed about 15 minutes," she said. "Got into jeep turned ignition on and put into gear and it flew out of my son's driveway across street into neighbors yard skidding (tire marks) on neighbors driveway before heading towards 2nd home down embankment and into 360 landing on passenger side of Jeep." Peggy, a retired federal court employee, said she was hospitalized and has been undergoing treatment since the accident for post-concussion syndrome, PTSD and other lingering after-effects. She consulted personal injury attorneys in Phoenix and Los Angeles but was rebuffed. "I was told that if I had permanent brain injury that would impact the rest of my life, the firm would have taken my case," Peggy said. Sadly, this is often the case; unless a consumer is killed or permanently disabled, the cost of litigation is so high that it is not economically feasible to sue. Lawyers also routinely turn down cases they don't think they can win. Lacking solid evidence that there is a known defect cusing incidents like Peggy's, many lawyers would decline to take the case. Peggy said she is not seeking to enrich herself by suing but wants to warn others about the risk of unintended acceleration. But NHTSA insists there is no evidence that manufacturing or engineering defects are to blame for those 16,000 yearly crashes, leaving driver error as the apparent cause. "Pedal error crashes can occur when the driver steps on the accelerator when intending to apply the brake; the driver’s foot slips off the edge of the brake onto the accelerator; or when the driver intends to apply only the brake, but steps on both the brake and the accelerator. This can cause sudden vehicle acceleration, often at full-throttle, with no brake force slowing the vehicle down," the NHTSA statement said. In fact, says NHTSA, many of the accidents are similar to Peggy's: "These incidents are initiated most frequently in vehicles that are traveling at very low speeds, such as when attempting to park the vehicle in parking lots and driveways." What's a driver to do? Get Familiar – Adjust your seat, mirrors, steering wheel and pedals (if they are adjustable) properly before starting the vehicle. If you are driving a vehicle you don’t normally drive, make sure to familiarize yourself with the location and feel of the accelerator and brake pedals. Aim for the Middle – Make it a habit to aim for the center of the brake pedal every time the brake is used. 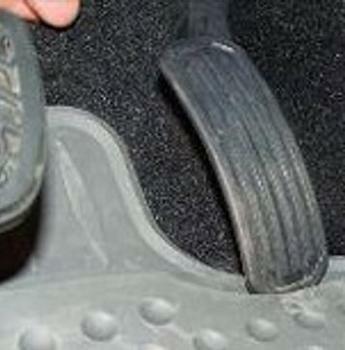 This reinforces muscle memory and reduces the chances of pedal error. Avoid Distractions – Stay focused on the driving task until the vehicle is safely stopped, shifted into park, and the engine is turned off. Be Cautious – Proceed slowly and carefully when pulling in and backing out of parking spaces. Wear the Right Shoes – Your footwear affects your ability to operate a vehicle. Footwear such as flip-flops, heavy boots, or high heels can contribute to pedal error crashes. Wear flat soled and light-weight shoes whenever you’re in the driver’s seat. Peggy's not likely to be happy with NHTSA's advice. "I'm here to tell you there is no driver error in my case," she told ConsumerAffairs. There have been successful lawsuits against auto manufacturers in scattered unintended acceleration cases but most consumers wind up like Peggy -- with a wrecked car, an insurance settlement, lingering aches and pains and nothing more. A few have to live with the guilt that lingers after a fatal accident.